I have written and spoken frequently about my passionate disapproval for children being actors. I have also written and spoken freely about my passionate support and possibly inappropriate adoration-bordering-on-obsession for the Yeshiva University a cappella group, The Maccabeats, whose “Candlelight” video released last Hanukkah has close to 6 million hits on YouTube and garnered them an audience with President Obama, interviews on the national news, and singing engagements all over the world into the next decade when many of them may be graying and middle-aged (but will still be adorable and wonderful, mind you). Since I gushed about The Maccabeats all over Facebook, Twitter and Kveller last Hanukkah, I have sparked an off-camera friendship with the Maccabeats. This friendship and sort of “observant Jewish celebrity kinship” has been intimately gratifying and has led me even further into the world of traditional Jewish study, Modern Orthodoxy, and spiritual growth. In this sense, being asked to be a part of this video was a very intimate and personal thrill. Even if I did not know them personally, though, being asked to be in this video the way they have asked me is conceptually very important as well. The Maccabeats’ first and second videos did not feature women, and they have come under some pretty aggressive and, in my opinion, bitter and vindictive attacks by many in the non-Orthodox world who have accused them of favoring men and keeping “their” women locked up and covered ankle to wrist. Their third video showed men and women praying and celebrating the Jewish New Year equally, separated in synagogue as is prescribed by Jewish law, and the Maccabeats have wisely avoided defending their love for women and the various appropriate and fulfilling interactions they can and do have with women. (the book containing the Torah, Prophets, and Writings). Women do that, you know. We also have a lot of control over our bodies, our interactions with men, and our choices. Many traditional women find it empowering to have limits to what people see of us and although we may be “limited” in some public arenas that outsiders might see as severely problematic, we are free to study and grow and develop “just like men.” This intellectual and philosophical growth allows us the identical potential and beauty of any man and–some would agrue–the potential for even more beauty because of our uniqueness as women. Needless to say, I am thrilled to be shown studying Tanakh in this video. And although my little crocheted hat looks a bit like a kippah from some angles, IT’S NOT a kippah, ok? How did my kids get involved? 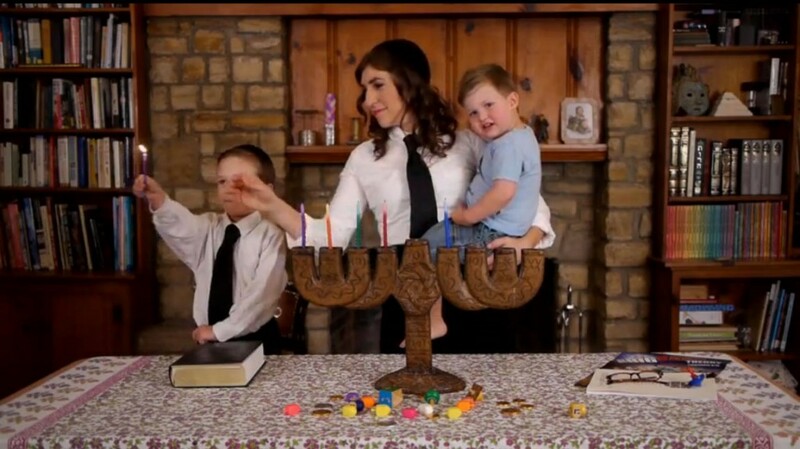 The video features families and Maccabeats alike lighting the hanukiah and I was asked if my boys would participate. You see, women are valued greatly in traditional Jewish circles for many things, but being a mother and wife rank high on the list. With an emphasis on women as leaders of the home and the ones who dictate the tone and rhythms of the home and family, the Maccabeats felt strongly that I be seen not only as a celebrity, and not only as a woman who studies traditional text, but also as a woman who embraces the role of being a mother. My 6-year-old, Miles, is a Maccabeat fanatic and when I told him they wanted him lighting the hanukiah with me in their next video, a bizarre Joker-like smile spread across his face as he uttered a phrase dripping with a false bravado which can only be described as a sweet transparent failure at being casual : “Okay, yeah sure, whatever, who cares,” (still grinning ear to ear and looking like he was about to explode). Fred was the wildcard. At just over 3, Fred is notoriously shy, speaks in phrases only we can understand, often changes his mind at the last minute about everything, and is very impatient when anyone even tries to take his picture. Fred also hates any expectations of him, so I very casually asked if he wanted to light the hanukiah with us for the Maccabeats video. He shook his head “yes” and I put him in his Maccabeats T-shirt. I didn’t bother to ask him to put on his kippah, since on any given Shabbat he refuses it altogether and I wanted to make this a very mellow transition. As an aside, my husband is not a very big Maccabeat fan (go figure) and he understandably notes that I am exceptionally fascinated with their videos, their CD, their T-shirts (I own three), and with seeing them in concert (which I have done several times). I was very prepared for my husband to say no to the boys being involved, but thankfully, he didn’t. In addition, since my book will be coming out this March with select photos of our sons on the cover and before each chapter, my husband felt that having them appear briefly in this video would not be any ‘worse’ than their pictures coming out in my book. And I think he knew that Miles would feel like a total rockstar being a part of this. How did we pull it off? I told the boys that The Maccabeats and the video director, Uri Westrich were in New York so they wouldn’t be with us in our living room (awwww). However, my freelance director friend Daniel was going to film it and I told the boys that it wouldn’t take long (that was a bold-faced lie, I admit it). Daniel set up in our living room as my hair and make-up was done (yes, I admit it, I totally splurged on fancy hair and make-up for this video, wore a SPANX; the whole bit). We FaceTimed with Uri and Miles looked at the phone screen as if Moses himself was appearing. I put on my white collared shirt and skinny black tie and Daniel decorated the hanukiah-lighting table with dreidels and chocolate Hanukkah gelt. That was sort of the end of worrying about Fred because that gelt very quickly became the way Fred stayed focused, on task, and very motivated to do “one more take” thus confirming Reason #47 and #82 of “Why Not to Let Your Kids Act” which is that you inevitably have to bribe them and you very quickly lose your convictions in the interest of the end product. Fred consumed approximately seven gelt coins, doled out in half doses. Miles joined the fun and ate about four total. Daniel worked very quickly and it was all over in less than an hour. So my lie didn’t even come to fruition (does it still count as a lie?). When the boys see themselves in the video on YouTube, let’s hope it does not confirm Reason #63 of “Why Not to Let Your Kids Act” which is that they will get very full of themselves and start demanding bubble baths of champagne and foie gras for breakfast (even though they’re vegan and hate bubble baths). Being a part of this video is very exciting for me and my boys, and in all honesty, I believe in the world seeing a new kind of Orthodoxy through groups like the Maccabeats. Their message is lovely, their intention is good, and they are smart and fun. I am humbly honored to be shown studying Torah and lighting a hanukiah with my sons. And being a part of a video by a group that I respect and adore is sort of insanely surreal; I feel like the girl in the “Dancing in the Dark” Bruce Springsteen video who’s pulled up on stage to dance with him during the concert except The Maccabeats can’t touch me to pull me up on stage, can’t watch a woman dance, and would never wear a red bandana around their kippah-adorned heads. Anyway. You get the point; it’s awesome to feel like the #1 fan who got chosen to be in their favorite group’s video. For more inspiring Hanukkah material, check out our Hanukkah gift guides, recipes, and other Hanukkah tunes.